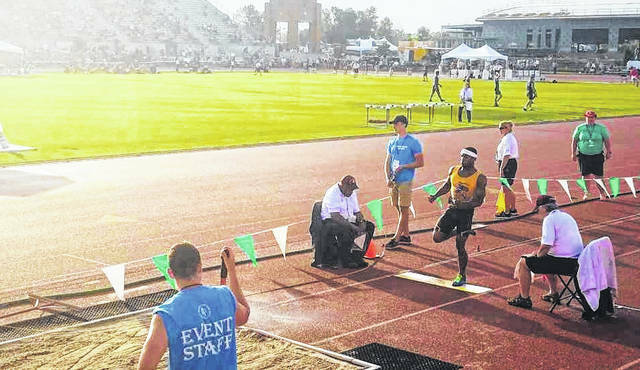 COLUMBUS — Colonel Crawford’s Chad Johnson was the only local athlete to win a state championship at last week’s state track meet in Columbus, and he did it in style. Johnson successfully defended the Division III 3,200 title he won a year ago, and he did it with a state-record effort. But Johnson was not the only success story at Jesse Owens Stadium last weekend as participants from Galion, Northmor and Colonel Crawford showed their stuff in the final high school meet of the 2018 season. COLUMBUS — After 2017’s state meet that was dominated by qualifiers from the boys team, the Galion Lady Tigers stole the show in 2018, sending five girls — Marisa Gwinner, Bri Streib, Kerrigan Myers, Jalyn Oswald and Brooklyn Cosey — to Columbus to represent the blue and orange in the 44th annual girls meet. The highest finish came from Gwinner in the high jump, who placed second. Looking to improve on her fourth place finish from a year ago, Gwinner entered the event at 5-feet, passing on the starting height of 4-feet, 10-inches. It was smooth sailing from there as Gwinner cleared that mark, as well as 5-2 and 5-4 and 5-6, while passing on 5-3. On her first attempt at 5-feet, 7-inches, Gwinner cleared with room to spare and was ecstatic on the mat post-jump. The pressure was now on Katelyn Meyer of Eastwood, the lone remaining competition for Gwinner. Meyer, who finished third last year, missed her first attempt at that height, but cleared on her second attempt to clear to send the bar to 5-feet, 8-inches. Meyer cleared that height on her first attempt, putting the pressure back on Gwinner, who fouled on each of her three attempts, giving Meyer the title. 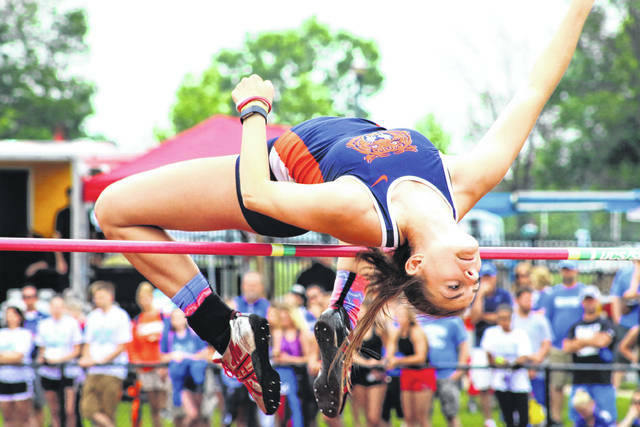 Gwinner finishes her high jumping career for Galion having placed third her freshman year, ninth in her sophomore campaign, fourth last season and as the Division II state runner-up in 2018. “This was probably the best meet that I’ve ever had,” Gwinner said. “I woke up jazzed, everything started clicking, it all just felt really good. Myers would also be in action in the high jump for the Lady Tigers on Friday. Myers cleared the starting height on her first try and 5-feet on her second attempt, but missed three tries at 5-feet, 2-inches to finish 12th. Galion’s other senior representative was Bri Streib, was in the distance competition. It was her first state-meet appearance. Things got off to a bit of a rough start for Streib as she fouled her first throw. In her second attempt, Streib would record a mark of 119-feet, 9-inches. Down to her final attempt to qualify for finals, she uncorked a toss of 124-feet, 6-inches to earn a slot in the top-nine finals. Knowing she had to get in at least one good throw, Streib’s top effort was 135-feet, 8-inches to finish in fifth place. Winning the Division II title was Katie Seyfang of Miami Trace, with a heave of 144-feet, 5-inches. Myers was a busy young lady in Columbus. She is the first member of the girls team to represent the Lady Tigers in four events. She did not make the finals in the 200-meter dash after finishing Friday’s preliminary running in 13th overall with a time of 26.34. She would, however, see finals action on Saturday in the 100-meter hurdles. After qualifying with the fifth fastest time on Friday (15.00 seconds), Myers took her spot on the track on Saturday alongside eight other runners and would cross the finish line in 14.77 to snag a sixth-place finish. Leah King of Perry won the event with a new Division II and state meet record time of 13.89 seconds. Gwinner and Myers, along with Jalen Oswald and Brooklyn Cosey, also took part in the 4×00 relay. In the prelims on Friday, the Lady Tigers foursome turned in a time of 49.67 seconds, good for the fourth fastest time and automatic bid into the finals. In the finals, they finished in 49.72 seconds to finish seventh. Gwinner will keep running next year as a member of the Tiffin University team. Senior Takoda Crisman, the Galion boys team’s lone representative at the state meet, failed to qualify for finals in the 200-meter dash after finishing the prelims in 17th place, in 22.91 seconds. Colonel Crawford, led by defending 3,200 champ Chad Johnson, sent four boys and just one girl to state while Northmor saw five boys and one girl n Columbus. Johnson was supposed to run in both the 1600 and 3200-meter runs at state on Saturday, the same agenda as in 2017. Much like a season ago, Chad opted out of the one-mile race and set his focus the 3,200. He got out to a roaring start in the race and would not look back. Distancing himself from the field early, it became apparent that the title was Johnson’s and his alone. When the gun sounded to signify the final lap of the eight-lap race, Johnson turned up the pace further. In fact, Chad’s final lap was 62.84 seconds as he cruised to a second consecutive title in the event with a time of 9:05.43. That time, aside from giving him the win by nearly 20 seconds, also set the new Ohio Division III mark as well as the Division III state meet mark. Johnson competed in the two-mile run in all four seasons of his storied high school career, starting with a seventh place finish in his freshman year and a runner-up finish in his sophomore season before winning it all in his final two seasons. On Friday morning, the Eagles’ 4×800-meter relay squad of Cody Reed, Braxton James, Brody Martin and Chad Johnson took to the track looking to get Crawford started on the right track. The foursome would go on to post a time of 8:07.68, roughly three one-hundreths shy of the school record, to earn seventh place and a spot on the podium. James, a junior, was in action on the track in the 800-meter run Saturday. He placed 18th, in 2:00.91. The Lady Eagles’ lone competitor was high jumper Drew Krassow, who finished ninth in the field, just missing a podium and All-Ohio spot after clearing a height of 5-feet, 2-inches. For Northmor, everyone was in action Friday, starting with the preliminaries for the 4×100 and 4×200-meter relay races on the boys side. In the 4×200, Meechie Johnson, Drew Zoll, Adam Petulla and Conan Becker would post a time of 1:31.22, the sixth fastest in the field, to qualify for finals. The same foursome ran the 4×100-relay team, but did not advance, finishing 17th in 45.06 seconds. “It’s really kinda sad and a little bittersweet,” said Johnson. “(Me and Becker) are running in our last race for the black and gold and it wasn’t quite the result we wanted, but I’m just happy that we got to get down here together,” he said. Senior Hope Miracle, the Lady Knights’ lone qua lifer, was in Friday’s pole vault. She cleared her first three heights putting the bar at 11 feet. Unfortunately, that’s where her high school vaulting career would end as she missed all three of her attempts to finish in a tie for eighth overall. Pole vaulter Tony Martinez finished cleared 13 feet on Friday evening, finishing 12th overall. In the long jump, Johnson was looking to defend his title from a season ago and finish his high school career as a three-time champion in the event. He won the Division III title as a freshman before finishing 13th as a sophomore, winning again a year ago. After roughly an hour and a half of weather delays, Johnson would get off a leap of 21 feet, 9½ inches to place third. His third jump would have given him the state title, but he fouled. Galion’s Gwinner, Crawford’s had Johnson and Northmor’s “Meechie” Johnson were competing in their fourth state meets. Gwinner finished her high jumping career with third place honors in 2015, ninth overall in 2016, fourth place in 2017 and as the state runner-up in 2018. Chad wrapped his state-meet career in the 3200 with titles in 2017 and 2018 after finishing as the runner-up in 2016 and seventh as a freshman in 2015. Meechie won the state title as a freshman (2015) and as a junior (2017) while also finishing 13th in 2016 and third this season. 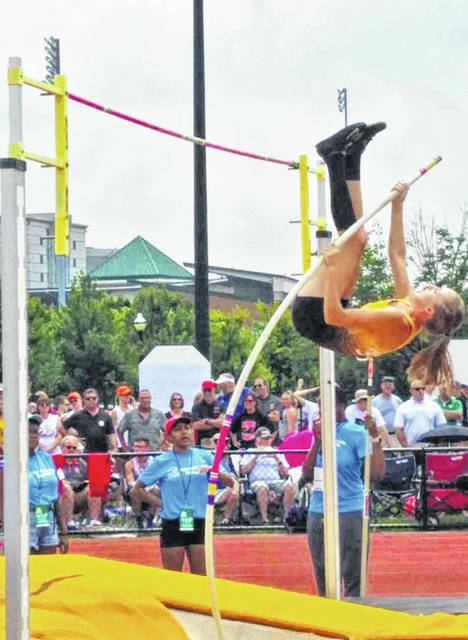 In 2018, the Division II portion of the state meet saw five total state meet records broken as well as three division records going down over the two-day event in Columbus, all by female student athletes. Mia Knight of Beachwood now owns two division and state meet records while Leah King of Perry sits as co-holder of one state meet record and the lone state meet and Division II record holder in another event. In Division II competition, three girls finished the weekend as back-to-back champions in their respective events after standing atop the podium a season ago. Over in the Division III events, three girls records were broken and one boys record was broken. Chad is now the proud owner of the DivisionIII state meet and Division III record holder in the 3200 after his time of 9:05.43 earned him his place in the record books. As for championships, four girls and four boys, including Johnson, repeated as state champions in their events from 2017. The East Canton Hornets boys team would repeat as team state champions in Division III, scoring 64 total points while the Minster Lady Wildcats snagged the girls crown, their 13th title overall, with 57 points scored. Division I action saw three girls records shattered, two boys repeat as event champions and five girls claim, at least, back-to-back titles. Leading the way in that strike was Abby Steiner of Dublin Coffman. Steiner earned her third state championship in the 100-meter dash with a new, clean sweep of the stadium, division and state meet records that she had previously owned. Her time of 11.38 seconds set a new standard for the DI athletes. Steiner also earned her fourth state title in (three) record fashion in the 200-meter dash, finishing in a time of 22.73. Gahanna Lincoln’s girls 4×800-meter relay team claimed the other stadium, state meet and division record time, turning in a championship mark of 8:53.49, which the public service announcer also stated may be the fastest time by a girls 4×8 relay team in the nation this season. That Gahanna Lincoln team also took home the girls team championship, scoring 51 total points while the boys from Pickerington Central earned their first state title with 58 points to outlast the field. 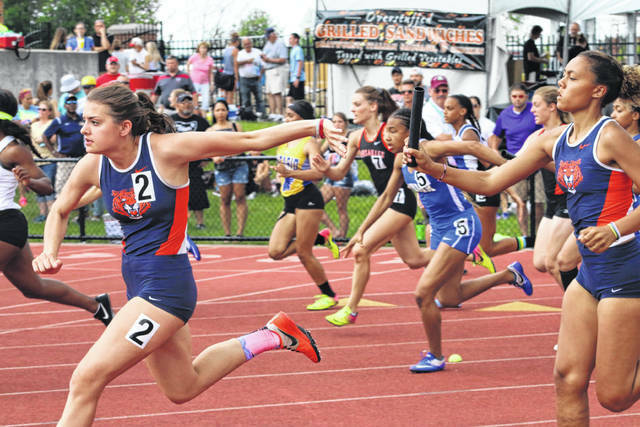 Galion’s Brooklyn Cosey hands off to the 4×100-meter relay team’s anchor, Marisa Gwinner in their sprint towards seventh place at the state meet. Cosey and Gwinner, joined by Kerrigan Myers and lead-off runner Jalyn Oswald entered finals with the fourth fastest time in the preliminary running of the event. 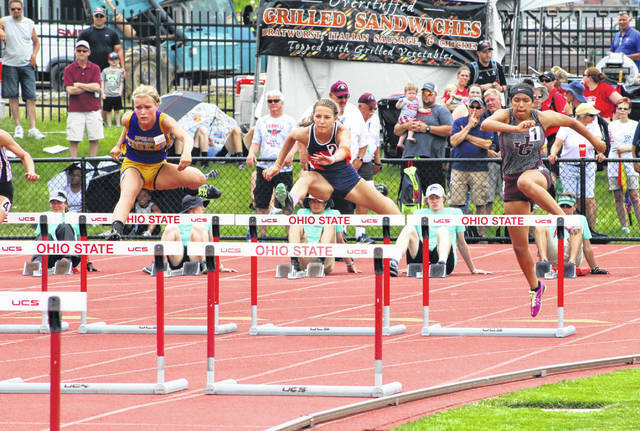 Kerrigan Myers, shown here in the 100-meter hurdles, was busy at the state meet over the weekend. Myers was in competition in four events, including earning a sixth place finish in the 100-hurdles. 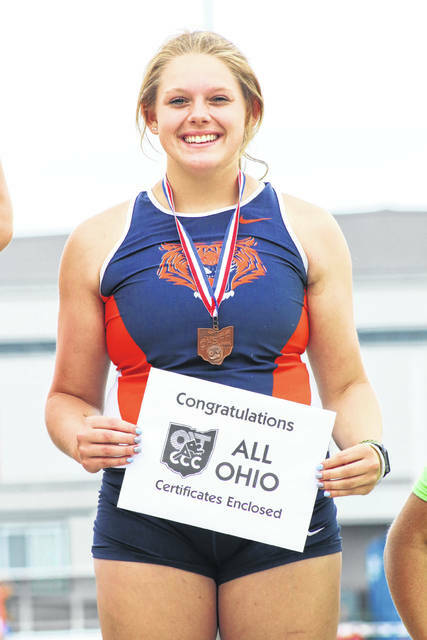 Bri Streib made it down to state in her senior season to participate in the discus alongside 15 other student athletes throughout Ohio’s Division II. Streib would finish in fifth overall down in Columbus in her final meet in the orange and blue. Marisa Gwinner took home runner-up honors in the Division II high jump event at the 2018 State Track and Field Championships. This season marked Gwinner’s highest finish in her four trips to the state tourney. 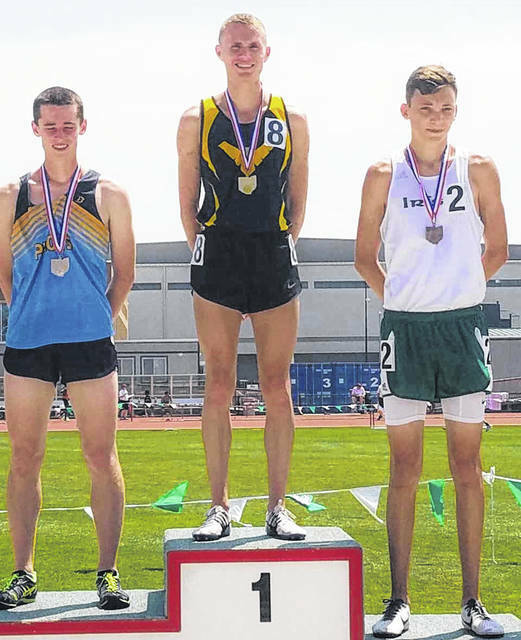 Colonel Crawford’s Chad Johnson stands atop the podium for a second consecutive year after winning the Division III 3200-meter run at the state meet on Saturday, June 2. Johnson earned the title by posting a time of 9:05.43 to set a new DIII state record and DIII state meet record.